Backplane Systems Technology presents Winmate's new EAC Mini Series EACIL22S IoT gateway for industrial applications such as IoT, machine automation and smart factories. A brand new industrial IoT gateway, the EAC Mini EACIL22S features a low power consuming Intel Apollo Lake N3350 1.1 GHz processor to maintain efficient power usage and USB Type-C video output to facilitate easy connectivity with devices such as USB Type-C displays. The USB Type-C connector works in Alt mode, meaning it can provide display A/V output, transfer USB data, and deliver up to 10W (2V/2A) of power. 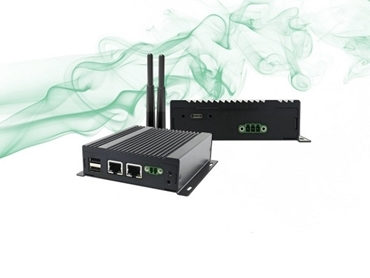 Feature highlights of EAC Mini EACIL22S IoT gateways also include a fanless cooling system; various mounting options (desk, wall, VESA); compatibility with Windows 10 IoT Enterprise, Linux, and Ubuntu operating systems for easy integration into established IT infrastructures; 2x LAN, 2x USB Type-A; wireless connectivity and all necessary connectors allowing data to be sent from manufacturing facilities directly to a cloud server for extra reassurance on data recoverability; and compact size of 100 x 90 x 31 mm in combination with its One-Cable design (USB Type-C Alt mode) making this EAC Mini highly suitable for IoT, smart factory, and machine automation applications.